*GIVEAWAY IS OVER – BUT PLEASE FEEL FREE TO USE FRIENDS DISCOUNT SHARED BELOW!. BlogHer as been a big part of the most “important” reason why I got involved in social media: Community! I joined in 2006 because I had pivoted from a career in a top consulting firm to starting my own business. Over the years I have gained the value of not only meeting a great community of social media entrepreneurs but also learning so much from BlogHer and the BlogHer conferences. That is why I am especially excited to attend BlogHer Pro 2013 as one of the Keynote Speakers on the Monetization: Brands & Bloggers Keynote Discussion with some fantastic fellow social media professionals including Ana Picazo of Finding BonggaMom, Jim Lin from Ketchum PR and Busy Dad Blog, and Sarah Penna from Big Frame.. BEST YET – I have a discount code and am giving away TWO BlogHerPro13 conference passes! Can you tell that I am excited to be sharing the fun with others? Just check out the other BlogHer Pro 2013 panels and speakers that include content management, mobile and business intensive workshops. Here is a link for where to register for BlogHer Pro 2013 and more details: “BlogHer PRO is a multi-track conference for professionally-minded bloggers looking to take their business, marketing, and technical skills to the next level. Improve your knowledge and hone your skills on everything from personal brand to personal finance to personal privacy.” Honestly, this conference is also for anyone in business that wants to learn more about the powerful medium of blogging and social media for business. DISCOUNT CODE: First of all I have a friends discount code to share (because my readers are my friends of course!) Use Friends Discount code, PRO13FF, for 30% off registration. Register today! GIVEAWAY: Second, I am giving away ONE CONFERENCE PASS to BlogHer Pro 2013 for TWO WINNERS (one conference pass will be given to each winner – 2 winners total). TO ENTER: Please comment on this blog post (by Oct. 11, 12pm PST) and then share on Twitter that you have entered this contest. DETAILS: PLEASE COMMENT ON THIS POST BY OCT 11, 12PM PST. To enter, please comment on this post then tweet out “I entered @TechMama’s #BlogHerPRO ’13 giveaway http://bit.ly/GDRZf4”. For the comment please share what type of questions you have about being a social media professional? Do you have legal, SEO, content, questions about interacting with brands or general questions about how this all works? Or I would love to hear your story on how you use social media professionally. WINNER CHOSEN AT RANDOM: The winner will be chosen randomly using Random.org and will be notified by Oct. 11 at 2pm pst. Winner must respond with confirmation by October 14 2pm pst. Rules: 1. One Blog Post comment per person. One Blog Post comment is equal to one entry (so only one entry per person) 2. Winners are limited by geography to US residents only 21 years of age or older. 3. If a valid email address is not provided in the entry, another winner will be chosen. 4. The prize is not redeemable in cash and must be accepted as awarded. 5. Approximate value of prizes may vary. 6. All decisions are final. 7. All Federal, State and Local taxes and travel expenses associated with receipt of prize is the sole responsibility of the winner. 8. By entering any giveaway on this website you release Techmamas.com from any liability whatsoever, and waive any and all causes of action. Disclosure: As a speaker on the Keynote Panel discussion for BlogHer Pro 13, I was assigned conference passes that I decided to share with my readers. All of my words are my own. The idea for this giveaway was also my own. The hardest thing for me is finding balance. I love blogging and the personal aspect of it. Don’t get me wrong, I put a personal, organic spin even on sponsored content; however, I tend to focus my efforts there. That way of writing pays the bills. I would love to find a balance and be organized enough where I could write more posts “just because.” All the while, still remaining a professional. I’m a San Francisco blogger. I”d love to attend and blog about my experience to my readers. Can’t wait to hear you. I’m having a hard time keeping up with social media. I’m not as social as I would like to be in real life, and I know it affects how involved I am in online social media. I could use some guidance on what would help me, not only for my blog, but personally. I don’t know that I can ever be comfortable enough to ever call myself a social media professional either, but I know that I need to at least try in order to help my blog and myself if this is the route I want to continue (and I do!). So, my question to you is how do I put myself out there without overwhelming my own “anti-social” persona. I don’t want to be someone I’m not, but at the same time, if I want to make friends and build lasting relationships with brands and other bloggers, I need to jump out of my comfort zone and step up my game. I just don’t know how. I hope this makes sense. I would love to learn more about how to build lasting relationships with brands. I find that after a review/giveaway, a lot of times, it’s hard to find how to continue working together long term. Any ideas? I have never been to a blogging conference. 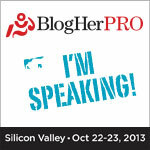 I would love to go to BlogHer Pro and learn how to take my blog to the next level. I’m so anxious to learn how to narrow down which social networks I should be focusing on! Thanks and congrats on speaking! I would like to know about SM tools and tips to help with time management. I get overwhelmed sometimes with so much info and wanting to share but get nothing done.